In designing the interior of our home, we are given many different choices when it comes to color and materials. Whatever is our choice has a great impact on how the space will look like and it will create the aura of the space. Have you felt the difference of a room with all white colors and another with some bold feature in it? You have to take this into consideration when choosing colors and materials for your home. Do you know what the commonly used palette in a residential interior is? Yes, your guess is right. It’s neutral colors. Many homeowners prefer this since it creates a warm and relaxing aura. But of course, you can also see some bright accents around the home. 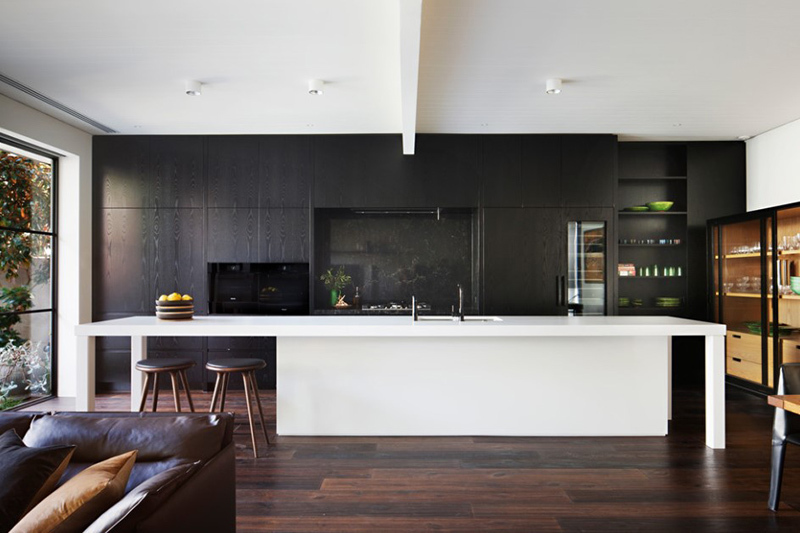 With that, we are going to show you some modern kitchens that made use of black, white and wood in it. You will definitely love this list since all the kitchens are really beautiful! Seen here is a large minimalist galley eat-in kitchen. It has a lovely combination of finishes just like how it added wood in the middle of the black cabinets. Light wood flooring balances the look. 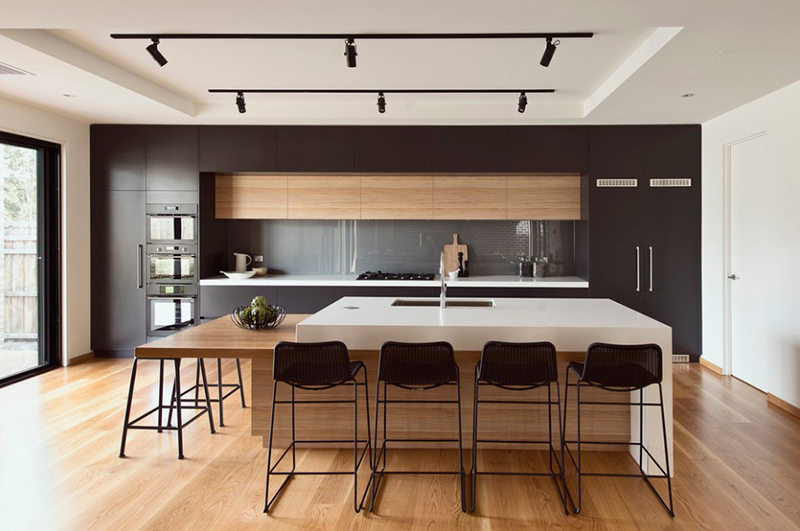 For this minimalist kitchen design, it used flat-panel cabinets which looks good with the stainless steel appliances and wooden features. Notice that the ceiling and walls are white. 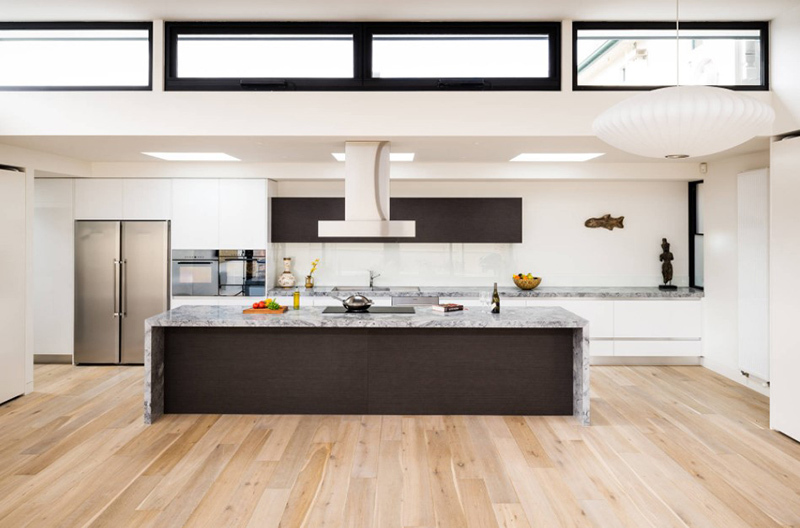 This bright and open kitchen is surrounded by glass windows around it. There are also folding doors that allow access to the outdoor area. The kitchen island adds a luxurious appeal to the space. 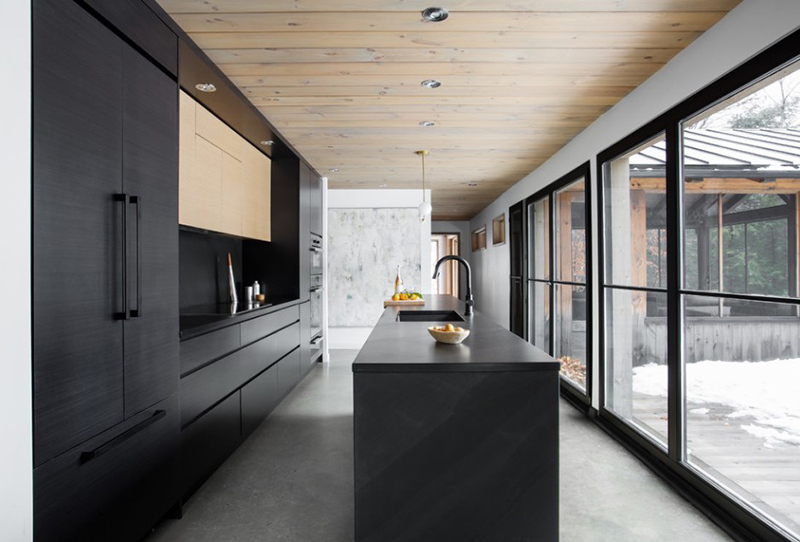 Look at how wood is being integrated into this kitchen. Notice how beautiful wood looks on the island and cabinets. The string of light in the cabinet also adds beauty to the area. In fact, it is very eye-catching! The stone slab backsplash is one feature that made it look attractive. 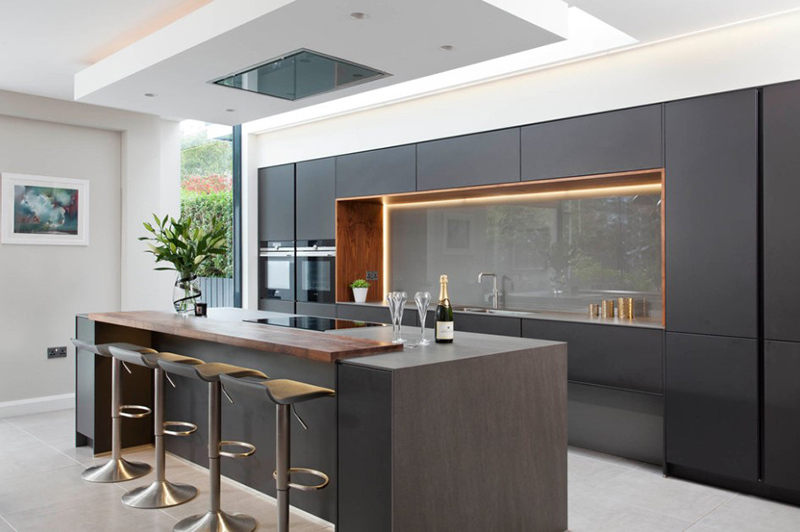 Notice also that glass is used at one side of the kitchen which brings natural light into the space. 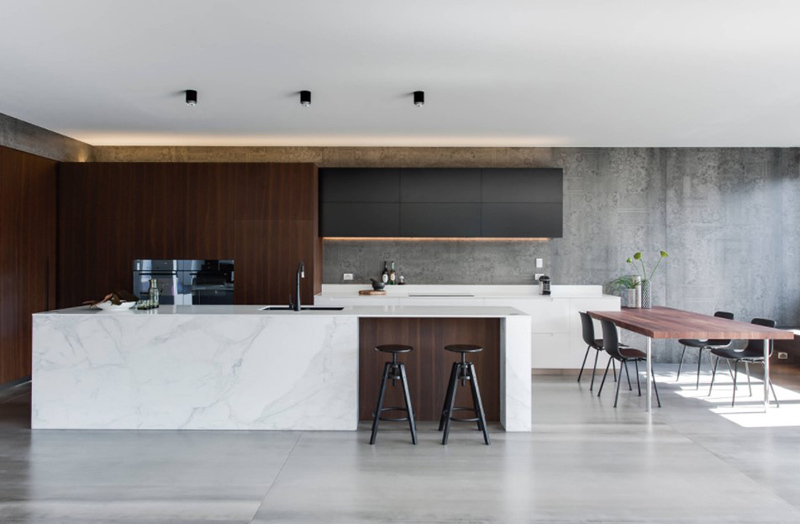 This kitchen has an industrial feel because of its concrete walls. But it looks nice with the wooden cabinets and the black wall hung cabinets. Of course, it is the white colors here that made it bright. 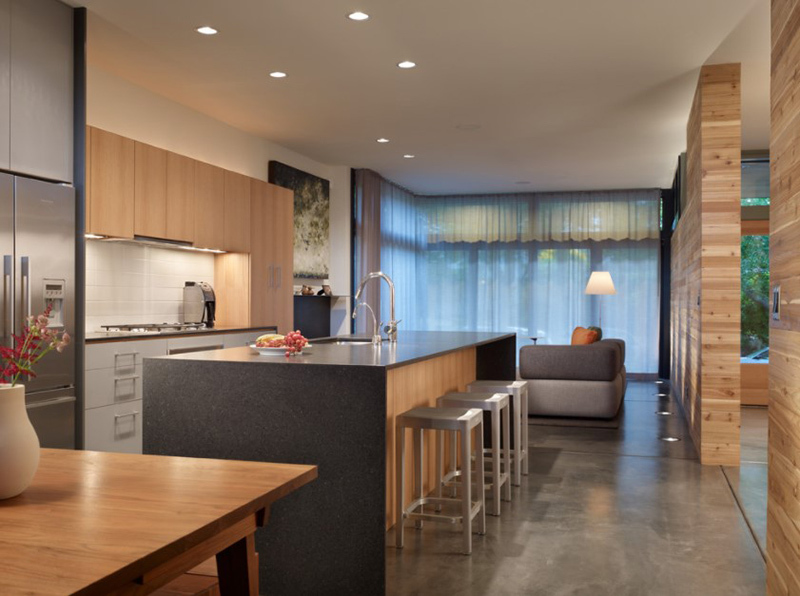 Granite countertops and wooden flat-panel cabinets give this space a luxurious appeal. 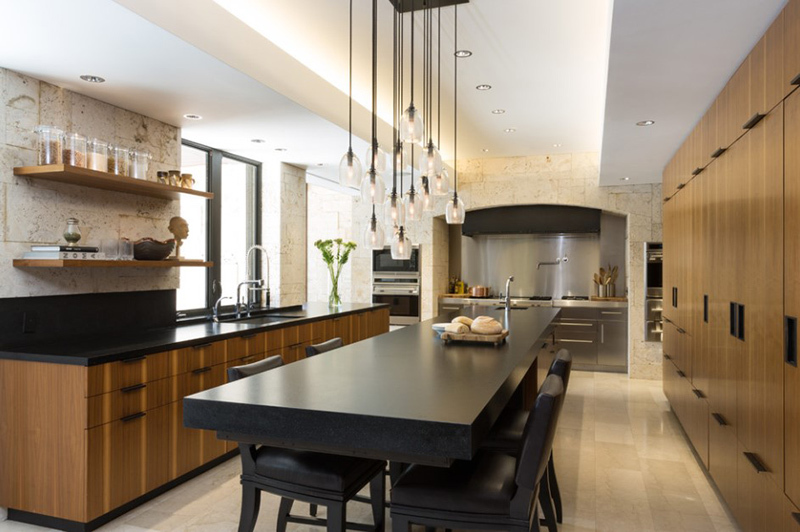 The lights in the kitchen bring a subtle traditional touch to the area. 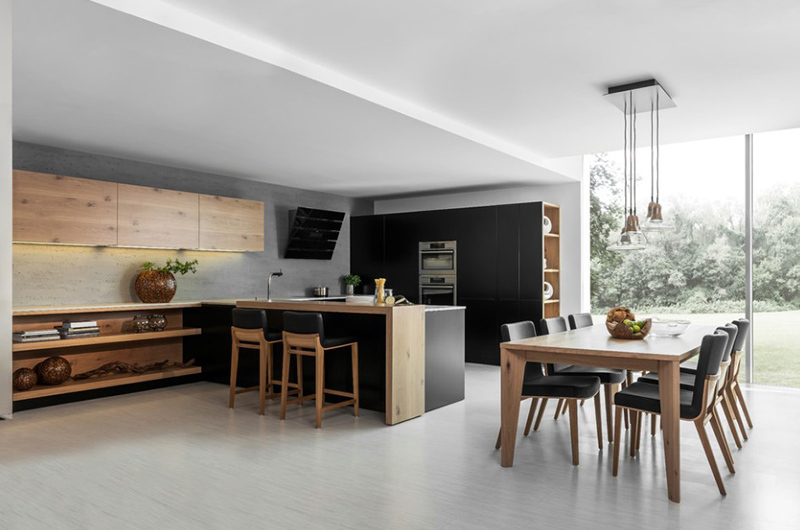 A modern galley kitchen with light wood floor and dark wood cabinets. What I like here is the wooden kitchen table attached to the island. 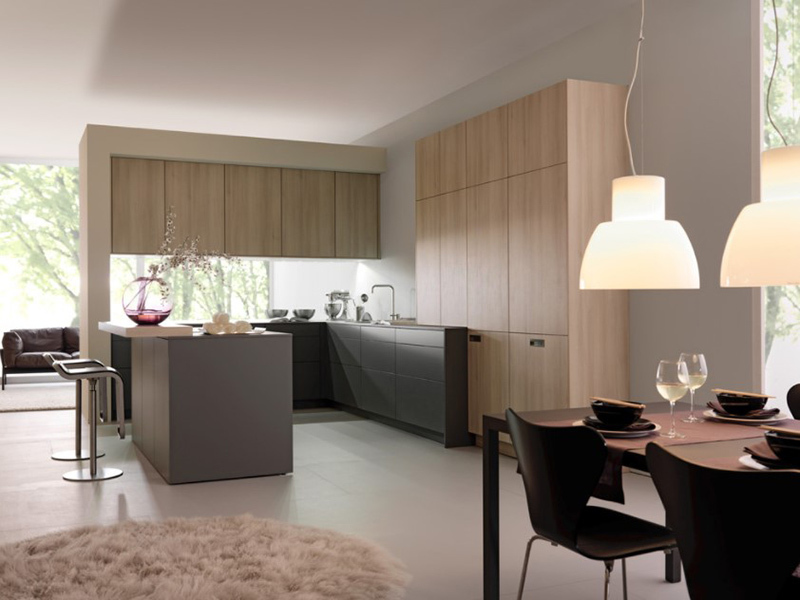 This kitchen has a modern mix of natural wood and laminate finish for kitchen diner. Because of its open layout, it is bright and airy. 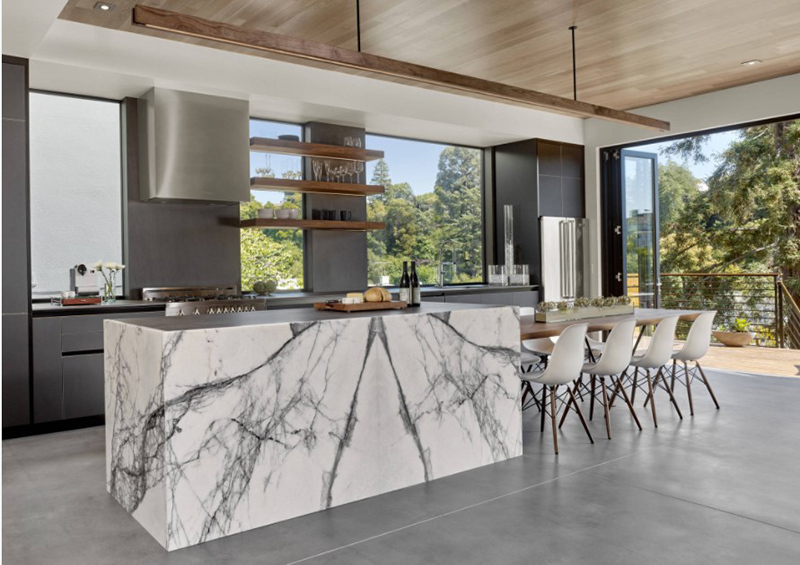 This minimalist galley kitchen has flat-panel cabinets and marble countertops. Although its primary color is white, it also has black colors in it. 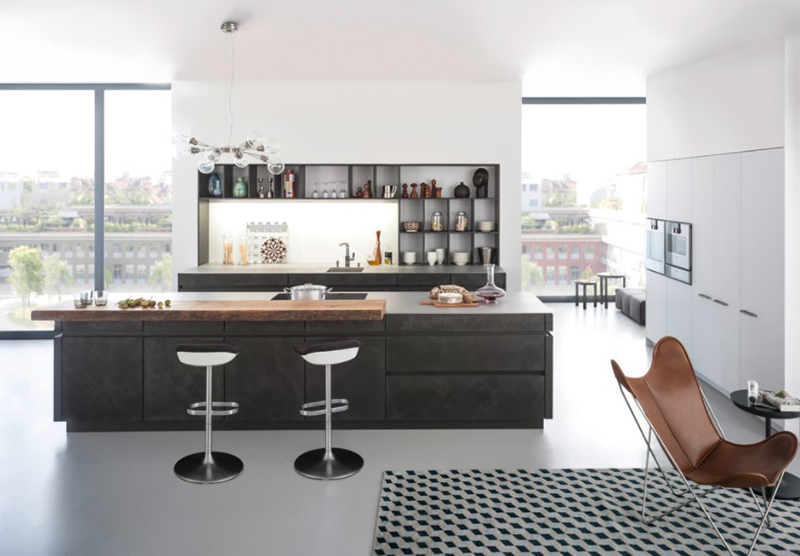 The open kitchen is at the center of the living space and forms the hub of family life. The island is made from granite and oak which invites people to gather. The contrast of black and white looks really nice here. 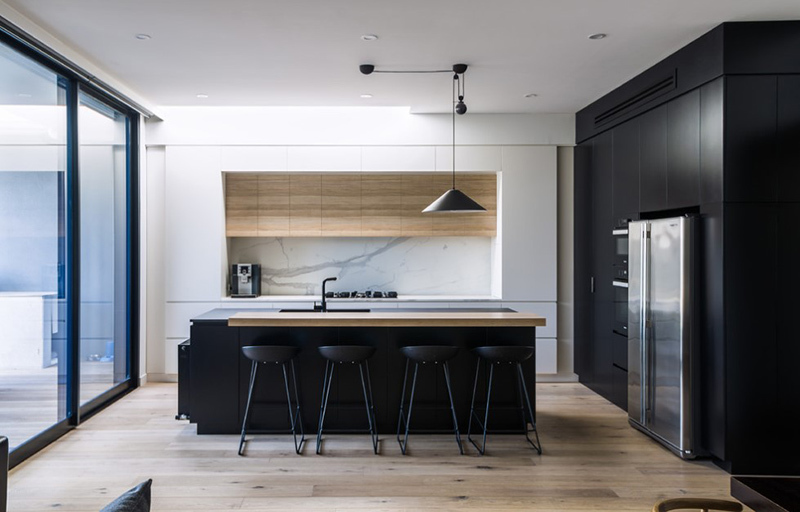 Who would think that black cabinets can actually look great in a home? 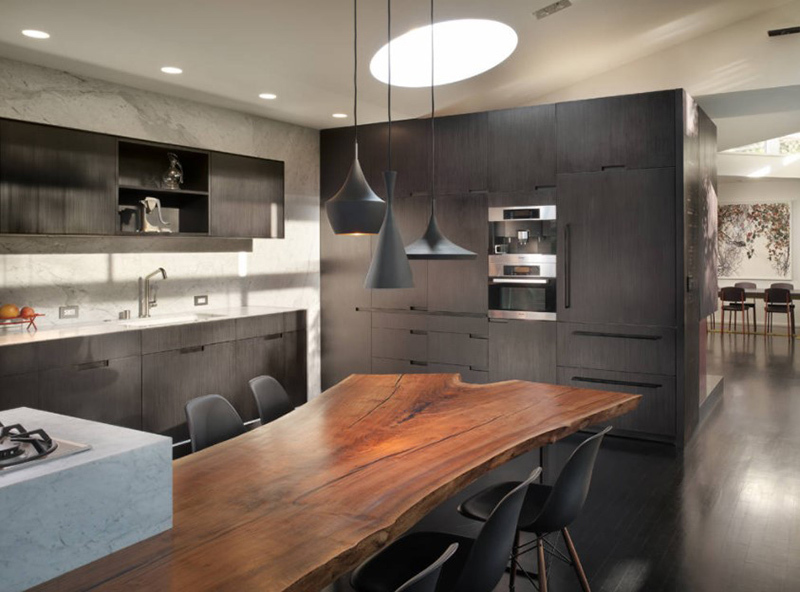 This modern kitchen has curves on its island and it also used glass not just for the island but even for the range hood. 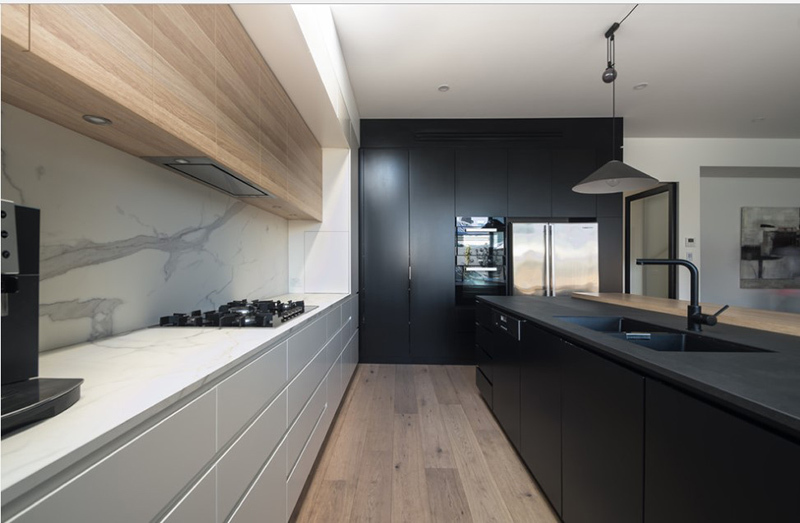 Aside from the black cabinets, what made this kitchen more attractive is the wooden table which breaks the contrast of the walls and cabinets. 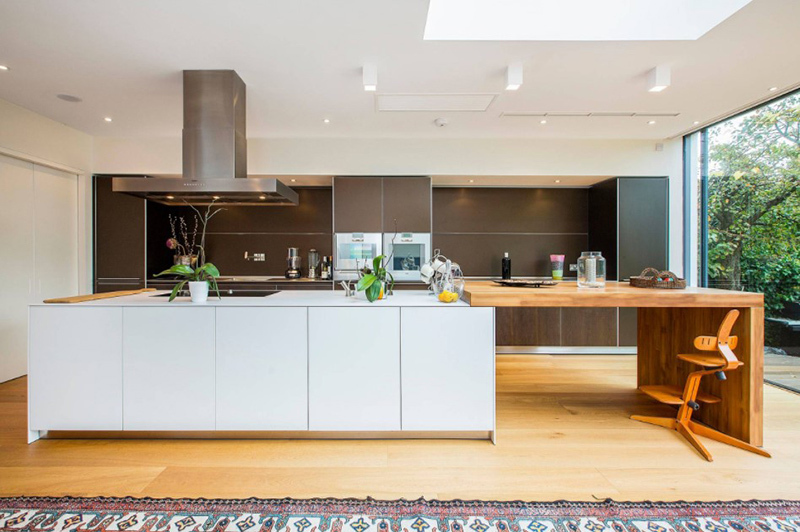 Adding a wooden top to the kitchen island is a great idea. It looks good with the black features here and the white backsplash. The patterns from the dining area’s area rug also adds appeal to the space. The goal for the kitchen was to create a dramatic and urban space in a rural setting. And it is obvious that they were able to achieve this. 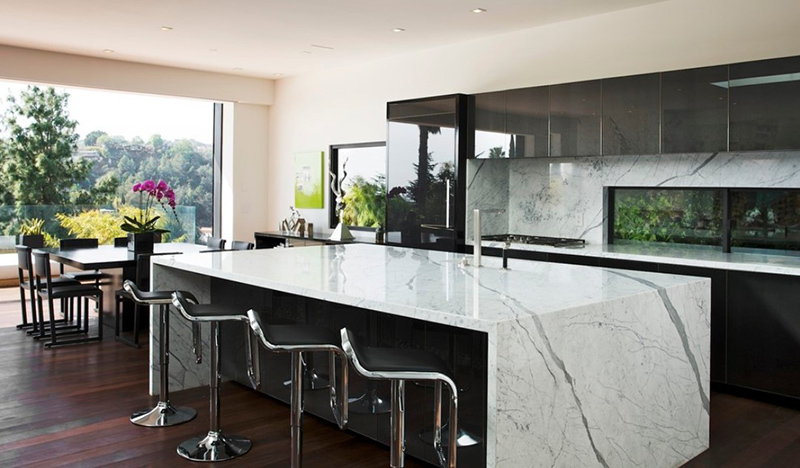 Marble countertops and backsplash looks great with the black cabinets in this kitchen. Notice also that it used dark wooden flooring which leads to the outdoor area. 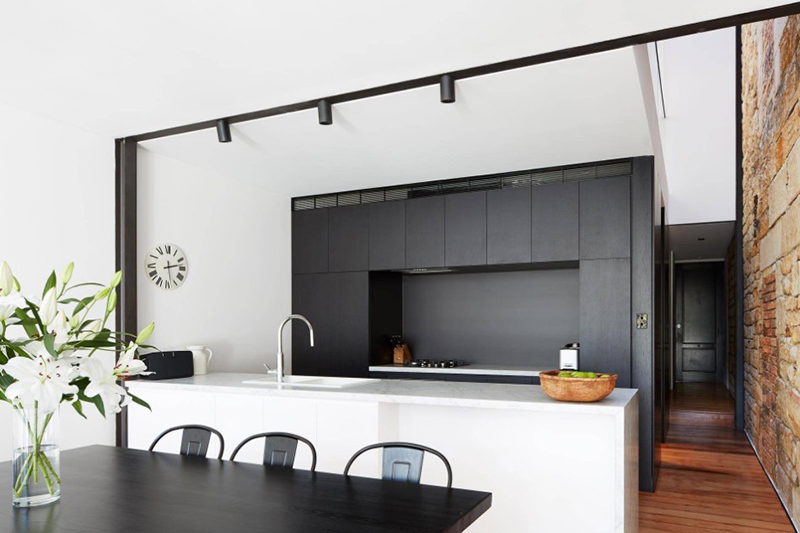 A mid-sized minimalist L-shaped eat-in kitchen which features a mix of wood, white and black kitchen cabinets. Feel free to check out how wood and white looks like in the kitchen. I love the soft and dramatic feel of this kitchen which we can get from the light wood cabinets and that fluffy area rug. It won’t hurt to add a black cabinet in the kitchen too! 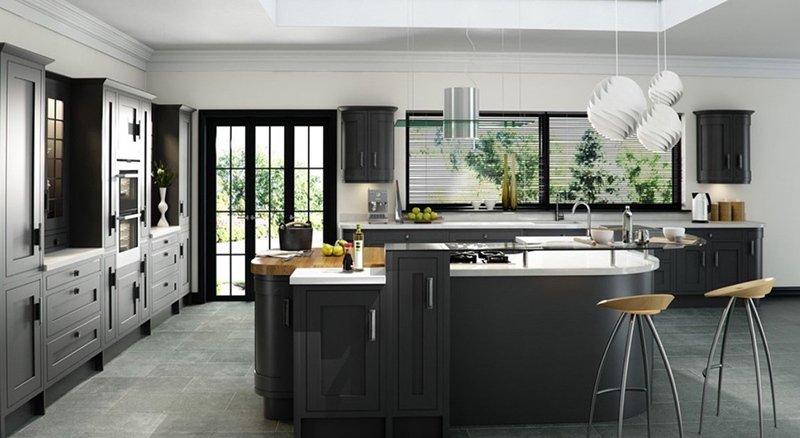 For a more compact look, you can also have a kitchen like this one with black cabinets on one side and a white island. The natural appeal of wood could really have a great impact in any space. It looks good whatever you pair it with. You have seen how wood complimented with the black and white colors of the kitchens above. Notice also that the usage of said color and material varies depending on the size and shape of the kitchen. But in whatever way they use it, it still looks really nice. 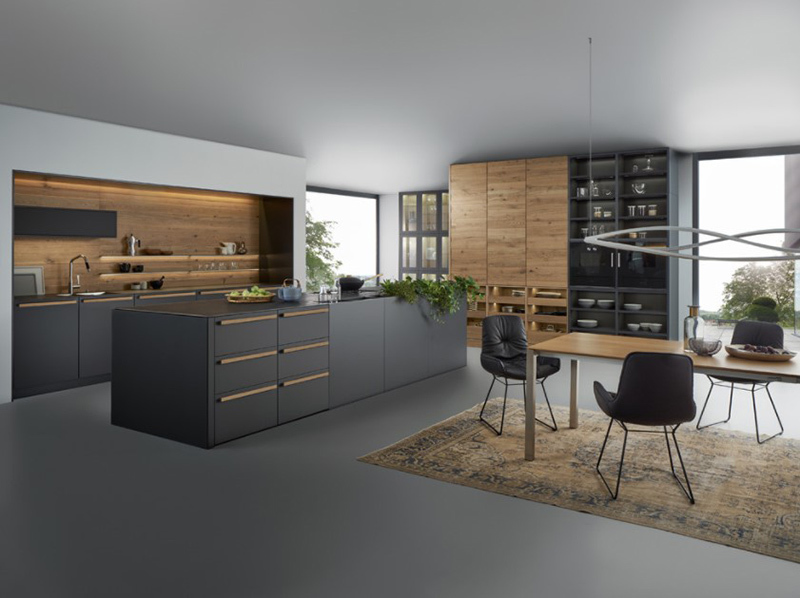 You can also check out kitchens with black and wood palette that we have featured before. For sure, you will love that list too!